If you ask people why they enjoy watching movies, you’ll get a ton of different responses. We like rooting for heroes, cheering for the underdog, witnessing good triumph over evil, and of course, we like the happily ever after that gives us a sense of hope. For some people, that happily-ever-after may not necessarily entail the guy-gets-the-girl resolution in a movie. I love endings in the movies where it all works out for the best romance-wise and if it doesn’t work out, it has to have one of those poignant endings like I saw years ago in A Walk to Remember. That one featured the popular high school guy falling for the unpopular girl. I liked it because in the beginning the hero warned her not to fall in love with him and he turns out to fall for her. In keeping with the same young adult romance theme, The Jerk Theory, the sweet high school guy turns himself into a jerk because he’s learned that nice guys finish last. That movie is cute and funny. I don’t like movies that kill off a love interest just for the shock value. Like One Day with Anne Hathaway. You root for the hero to get his crap together and when he finally does, they kill off the woman he loves in a rather gory accident??? Hated that. Some of my male friends were surprised when they first learned that I love movies that feature cars and racing or man versus machine. I loved the Fast and Furious movies for the racing and Unstoppable with Denzel Washington and Chris Pine because of the man versus machine tension. Sometimes, I’ll buy a movie just because it has a certain actor in it, which has led to watching movies with some unhappy endings. 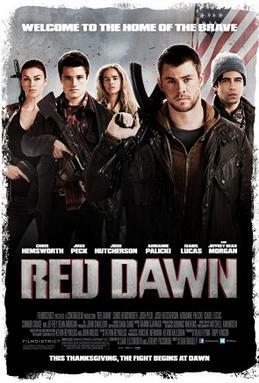 I never saw the original Red Dawn. When I found the new one with Chris Hemsworth, I got it because, it’s the Thor guy (‘nuff said). After the characters went through all that hardship, he ended up dying? Not a happy camper. Movies that have an unexpected twist in them are some of my favorites. The Recruit with Al Pacino and Colin Farrell was like that and so was Vantage Point with Dennis Quaid. If you’re looking for sweet movies, there’s Sundays at Tiffanys with Alyssa Milano and hottie Eric Winter or Bride & Prejudice—it’s a take on Pride and Prejudice that’s laugh out loud funny. It stars Aishwarya Rai and Martin Henderson. The couple doesn’t share a kiss through the entire movie but there’s so much subtext that it’s fantastic. One of the most sadly poignant movies I’ve seen is If Only with Jennifer Love Hewitt and Paul Nichols. I didn’t know it was that kind of movie or I might not have bought it but in the end, I’m glad I did. It’s incredibly ugly-cry sad, but is a beautiful tale about the lengths a man goes to in order to rewrite a tragedy. I just got the 2Guns movie starring Denzel Washington and Mark Wahlberg. I’ll let you know what happens. Sonya loves writing all things romance whether it’s writing contemporary adult or teen fiction and still hasn’t lost the wonder that she gets to do what she loves. She enjoys reading, movies, chocolate, and laughter. Her debut novel “Stealing the Groom” released in March 2014. Visit her at http://sonyaweiss.com/ or https://twitter.com/SonyaWeiss. Stealing the Groom is available on Amazon Kindle, Barnes and Noble Nook, and iBooks. And don’t forget to check out her Debut Novel!! Chad Walker may be a take-no-chances man with a plan, but there’s no way Amelia Snyder is going to let her best bud marry Mean Girl #1—even if the wedding is solely so he can secure the controlling shares in his family’s company. But free-spirited Amelia’s at-the-altar groomnapping scheme takes a surprising turn when she ends up as the blushing bride instead. Suddenly, with Amelia living in her handsome husband’s home—in his bedroom, no less—she starts to reconsider their strictly platonic arrangement. But Chad’s always been strictly anti-risk and definitely anti-love, and betting a lifetime of best friendship on the chance at forever might be the biggest gamble of all. Also, your new book sounds great! Love the friends to lovers–or in this case, spouses–trope! Congrats on the release! OMG, you are so right on the money here, I hate it when the hero dies. I need the nice neat feel good happy ending to be satisfied. It may not turn out the way I want it to – but it has to be a satisfactory ending – and that doesn’t include the hero dying! Yes, I almost threw my soda can at the TV at the end of City of Angels! Unhappy and unsettling.